Peter Williams defends the gospels being authentic by appealing to names of people and places mentioned by the authors. The first 20 minutes discusses just the names of various persons. Held my attention, even though I was previously aware of this argument. Worth the 30 minutes. Scripture does seem to indicate that saving faith is a gift from God. (Ephesians 2:8) While we are culpable for all our sins, including our unbelief, am I right in understanding that you believe God offers all people grace through faith (the kind that raises the spiritually dead to spiritual life) and that some people reject the offer? If that is correct, do you believe that faith is only operable upon receipt by the individual? In other words, how does one receive the gift offered if they are dead in their trespasses and sins?. You mentioned “ineffectual regeneration” in the post. I’m not sure if you accept that term or not, but if you do, do all people get “spiritually raised from the dead” and then spiritually die again if they reject? I think that faith in 1 Corinthians 12 is a special gift of faith that is not given to all Christians; for example the sort of faith that can believe for miracles. This is because it occurs within a list where Paul states each gift is limited to some. Paul says: to one is given this, to another this; this includes faith. Then he summarises by saying, "to each one individually as he wills." This is not particularly controversial, even Calvinists see a special faith here. I do not think that faith in Ephesians 2:8 is a gift (this will require a post of its own). So I don't see faith in God as a gift from God. I see it as our response to his calling. Well, I wouldn't say "through faith." 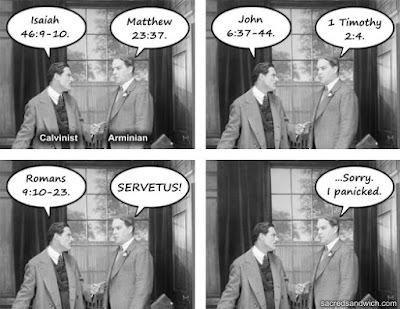 Part of the problem here is that I am addressing Calvinist terms which carry suppositions that I do not subscribe to. So I am trying to be generous by using the term they have chosen but this can backfire because by conceding the term it may seem as if I agree with their suppositions, or worse, they equivocate. So I don't mind the theological term "synergist" but I object to those who go from synergism to the claim that Arminians think that they save themselves. I would prefer to say that God is calling all men to himself. Because God is calling us that is an act of kindness, or, if you like, grace. This is usually called "prevenient grace". God does that regardless of whether we will have (saving) faith. By "saving" I mean the type of faith that results in God saving us, I don't mean our faith effects salvation for us. I don't think that prevenient grace saves people, it is God showing his kindness to us. This prior state Calvinists call "total depravity" and (spiritual) death (Eph 2:1). So all men are in this state prior to God regenerating them and God effecting a saving faith in them. They claim this is effectual because God's regeneration can not fail to result in a man coming to faith and being saved. Now I don't really agree with what Calvinists think "dead" means. Are people spiritually dead? Yes, but in the sense that they are lost without Christ. Those who die without him are damned. I don't think that we are unable to do things, nor do I think we are unable to respond to God. We are disposed against God but we respond to him. To the (hypothetical) question "can dead people do anything ?" my response is this is over-reading a metaphor. When Isaiah says all our deeds are filthy rags he is speaking hyperbolically. I believe men are fallen and sinful, and men are often worse than they realise, but I am cautious when people apply deductive logic to statements that are not meant as ironclad premises. So God desires all men to be saved. He calls all men to himself. We can accept or reject God's call. That is what Arminians mean by resistible. Using Calvinist terminology this would mean that God's call is "ineffectual" in those who reject him, but this is not a useful term as it is subtly conceding that the call could be effectual. However Arminians don't think that the call is effectual or ineffectual. We don't think it works like that at all. Rather we think that faith is something we choose to have or decline to have. We do not receive faith. Faith is not something that God can cause; just as love is not something God can cause. This is not a limitation of God, this is the nature of love and faith. For love to mean anything it must originate from the person. So people aren't made spiritually alive and then made spiritually dead if God's call is ineffectual. Rather God's prevenient grace is always at work and those who respond to God in faith God saves. Not a meme. But funny. I have seen some discussions on social media, though not participated in, that involve Calvinist memes. I am aware that the nature of memes limit nuance, and that some claims are intended for their rhetorical effect: they attempt to focus on the main issue and statements may be hyperbolic. Nevertheless, several are just plain false. And I am somewhat taken aback at the superficiality of some Calvinists as well as their arrogance. However what most struck me was that they seem to hold to a theology that the prophets, Jesus, and Paul castigated in the Jews. But to that shortly. So a search for Calvinist memes (and Arminian memes) shows that a lot of time has been put into this. I wanted to deconstruct a few of them which will lead to where I wish to go. Unregenerate people are dead in sin and cannot choose God, it requires God's sovereign mercy to give life. The problem here is that the contrast is not dichotomous. Let's assume that "deadness" prevents men from choosing God. How does that relate to God saving us? God is surely able to vivify a dead sinner so that he is able to choose God, or not. Such vivification does not necessarily entail salvation which is what "life" here means. And why sovereign mercy? God chose Abraham but you choose God. That God chooses means that we can't? So choice is not a communicable attribute of God? I'll see your Calvinist philosophy and raise you Scripture. Scripture constantly tells us to choose righteousness and shun evil. God tells us why he chose Abraham. Abraham responded to God in faith. God is always looking for faith. We are to have faith Christ. Choose life and live. Would a loving God pick and choose? What about Israel being the chosen ones of God. And this is just the point where (some) Calvinists are close to following the Jews into damnable doctrine. The Jews thought that they were in because they were the chosen people. So God sent his prophets against the Israelites again and again. Jesus warned that the Ninevites would be entering the kingdom before the Jews who rejected him (Luk 11:32). Paul warns several times in Acts and in his letters, including in the very book that Calvinists so love—their favourite chapter even—that being part the chosen race does not get you into heaven (Rom 9:6,31). You couldn't rely on being an Israelite then and you can't rely on being a Calvinist now. God does save men, but what does he say? Believe in the Lord Jesus Christ (Act 16:31). God's criterion is faith. There are several features in the gospels that speak to authenticity. By this I mean there are events that would seem unlikely to include in a forgery. While events in history may happen as expected, thus a record of such would occur in authentic and inauthentic documents, less convincing events would seem less likely to be recorded by a forger trying to convince others of his story. We judge convincing events by what the readers and culture would consider persuasive, not us. A feature mentioned frequently by apologists is the first witnesses being women. In a culture that valued the testimony of men higher than women it would be less likely that a false story about Jesus' resurrection would have females as the first witnesses. Another interesting feature of the gospels is the lack of seeing Jesus by several of the first witnesses. The empty tomb is the earliest feature. Why not have witnesses see Jesus coming out of the tomb? Rather we have an empty tomb with Mary Magdalene assuming others had taken Jesus' body (Joh 20:2). Next, the inclusion of irrelevant features. The location of the grave clothes, who got to the tomb first. Further, the disciples did not immediately believe the women. Though this may be consistent with the lesser status of women as witnesses in that culture, it would seem less likely that a forger would invent this response. Latter even Thomas was noted to disbelieve the testimony of several of his friends. Lastly, when Jesus was seen he was not immediately recognised by his followers. Mary Magdalene thought he was a gardener (Joh 20:15). The disciples walking to Emmaus were prevented from perceiving his identity (Luk 24:16). Why write this into a fictional story attempting to convince others about Jesus' resurrection? If the resurrection did not happen then the gospels are fraudulent. Yet several episodes are mentioned which would seem to be unusual for a false witness to include, a false witness seeking to convince others of the resurrection.